Today, energy is possibly one of the most critical sources for humanity. On Earth, we make use of different energy resources such as fossil fuels (coal, oil, etc. ), nuclear power, and renewable energy (solar, wind, geothermal, etc.). Similarly, space missions require power at different stages of their life cycle, and they require their own power sources. For the satellites orbiting Earth, the state-of-the-art technology is solar power, where electricity is generated by the photovoltaic effect of sunlight on certain substrates, notably silicon and germanium. Missions to study Sun and the inner-solar system planets like Soho, Mercury Messenger, and Venus Express, also make use of solar power, employing solar panels to generate the necessary electric power to keep them running. However, because the intensity of sunlight decreases with the square of the distance from the Sun, solar power becomes too weak beyond a certain distance and the spacecraft that are sent off to the outer solar system and beyond need a different source of energy to power up their systems. (The Juno spacecraft, launched in 2011, will be the first mission to observe Jupiter using solar power; however it will need to employ three huge solar panels of 2.7 m x 8.9 m size to meet its power requirements.) Also for landers and rovers that must operate on dusty surfaces or on the dark side of planets in long-duration shadows, solar power is not an option. Illustration of a Radioisotope Thermoelectric Generator (Credits: US Department of Energy). For such missions, nuclear power systems have been used for more than five decades, enabling us to construct a knowledge base about distant planets and interstellar space. The two basic types of nuclear power supply used in space are “nuclear reactors” and “radioisotope sources.” In a nuclear reactor system, the energy source is the heat generated by the controlled fission of uranium. This heat is then transferred by a heat-exchange coolant to either a static or dynamic conversion system, which transforms it into electricity. In a radioisotope system, unstable chemical isotopes (radioisotopes) are used as the heat source; but unlike nuclear reactors, no fission or fusion processes are used. Rather, this technology relies on thermoelectric materials—special kinds of semiconductors that generate an electric current when one end is kept hotter than the other end. The greater the temperature difference, the more electricity is produced. These systems, generally referred to as Radioisotope Thermoelectric Generators (RTGs), are known to be simple and very reliable since they do not involve any moving parts. They are also long-lasting power sources since they operate as long as the isotope produces a useful level of heat. The US only tested one nuclear reactor in space to date, and mostly used RTGs in its missions. Russia, in contrast, has launched about 40 spacecraft with nuclear plants aboard, as well as some with RTGs. However, if we exclude Earth orbiting spacecraft, it would be correct state that RTGs has been the dominant nuclear power system for space exploration missions. The first nuclear-powered spacecraft, the navigational satellite Transit 4A, was launched more than 50 years ago, in 1961. Since then, dozens of spacecraft have been launched carrying RTGs and have explored the Moon and almost every planet in the solar system. In many of these cases, the radioisotope was not only used for power generation, but also to keep the spacecraft warm in frigid environments on planetary surfaces or in deep space, which is quite critical for efficient operations. The figure below from Space.com shows the US space probes that have carried RTGs. It is worth mentioning that, after 37 years of operation, Voyager-1 is now officially the first man-made object to enter interstellar space, and its RTGs are expected to keep on working until 2025! US Space Missions with RTGs (Credits: Space.com). Plutonium-238, with a half-life of 88 years, is the most widely used radioisotope in RTGs. With its high heat capacity, it allows the heat sources to be compact while resulting in useful levels of energy after the heat to electric conversion process. One kilogram of Pu-238 can generate approximately 560 watts of thermal power. Another advantage of Pu-238 is its emission characteristics. In contrast to several other radioisotopes that release nasty gamma or beta radiation, Pu-238 decays by an alpha emission process and has exceptionally low gamma and neutron radiation levels. Since alpha particles can be stopped by material as thin as a sheet of paper, using Pu-238 eliminates any heavy shielding requirements to protect both humans and the spacecraft from the radioactive effects of the isotope. As a summary, Pu-238 is a special material with several unique features which have made it the preferred choice to power space missions for decades. However, there is a problem: we don’t have any more of it! 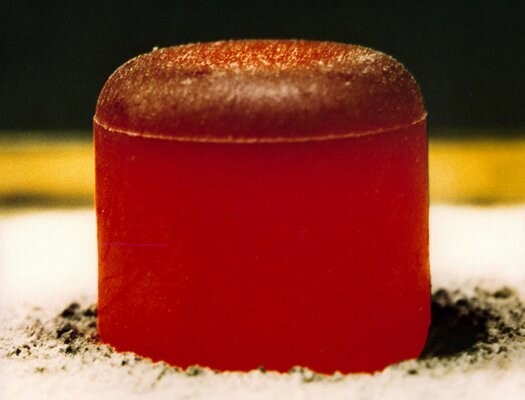 An Pu-238 pellet (Credits: Los Alamos Natıonal Laboratory). Of course, this situation did not pop out suddenly. Naturally, plutonium can be found in extremely small traces, but Pu-238 was discovered in 1940s by researchers. It was than produced in several laboratories around the world for several decades. However, The United States terminated Pu-238 production in 1988 with the end of the Cold War and augmented the demand by purchasing stock from Russia. However, Russia reneged on a contract to supply the US in 2009, and according to a Wired author Dave Mosher: “it’s not just the U.S. reserves that are in jeopardy. The entire planet’s stores are nearly depleted. The nuclear crisis is so bad that affected researchers know it simply as “The Problem.” Mosher estimates that NASA is left with 15-16 kilograms of Pu-238 in stocks, whose energy potential continuously depletes by around a percentage point each year. Considering that each of the previous RTG-powered space missions used 3 to 11 kg of Pu-238 aboard, this stock will only be enough to launch 2-3 small deep-space missions within the current decade. Considering that Pu-238 is so scarce, are there not other radioisotopes that can replace or back it up? Actually, the European Space Agency (ESA) is considering alternative nuclear fuels to power its upcoming probes traveling into the deep space. “To see ourselves as a serious planetary science partner on the world stage with the United States, we’re building up our nuclear capability for European-built RTGs,” David Southwood, ESA’s director of science and robotic exploration, said in an interview with Spaceflight Now. 3. Require little to no shielding, in order not to interfere with sensitive instruments aboard and also to protect humans. Pu-238 is the ideal fuel because it is shows good performance in all four categories. Other possible solutions such as Strontium-90, Polonium-210 (which was used in older Russian RTGs), and Curium-242/244 lack at least one of the above properties. The only reasonable alternative seems to be Americium-241, which has a longer half-life (over 150 years), but around ¼ power density compared to Pu-238. Americium-241 exists rather in large quantities, since it is a by-product of regular power reactors. So, if more energy-efficient RTG designs offset its low power density, it might be a feasible alternative as a spacecraft fuel in the future. However, being a more aggressive neutron emitter than Pu-238, Americium is a greater radiation hazard for the scientists and engineers who handle it. Currently, worldwide production of Am-241 is only a few kilograms per year, most of which is already used to fill demand for smoke detectors and moisture gauges. According to flightglobal.com, BNSC space science director David Parker says that Harwell (ESA’s new facility in the UK) will study Americium as an alternative to Pu-238, and Oxford University is researching infrared-related technology as an alternative conversion solution. Researchers have also discussed the potential use of a rarer Americium isotope, Am242m, in space applications. This isotope can be created when Americium-241 absorbs a neutron and generates a very efficient fission reaction. However more studies have to be conducted before any real application can be attempted. Current RTG systems in use, called the Multi-Mission Radioisotope Thermoelectric Generators (MMRTG), convert only around 8 percent of the heat energy released to electricity. Therefore, an increase of the conversion efficiency of RTGs is a current engineering requirement and challenge, whether they are operated with Pu-238, or any other alternative fuel. A new design concept called the Advanced Stirling Radioisotope Generator (ASRG) was studied over a decade at NASA, using a Stirling thermodynamic cycle to extract electricity out of Pu-238. The Stirling engine works by heating and changing the pressure of the gas inside, causing a piston movement. However, although this concept generates almost four times more electricity for the same amount of plutonium compared to the current RTGs, it might set a limit to the useful life of the spacecraft since it involves moving parts which could affect the sensitive instruments aboard due to continuous vibration. Just as it has always been a point of discussion for terrestrial nuclear systems, the “safety aspect” of nuclear power in space should always be kept in mind and questioned as well. Compared to alternative isotopes, safety officials say Pu-238 is the safest fuel for nuclear-powered spacecraft. Within the available set of fuels, this statement might be correct for the nominal operation conditions in a mission, but what if the mission fails? To minimize the risk of the radioactive material being released, Pu-238 is stored in individual units with their own heat shielding in RTGs. They are surrounded by a layer of iridium and encased in high-strength graphite blocks. These two materials are corrosion- and heat-resistant. An aeroshell surrounds the graphite blocks and protects the entire assembly against the heat of reentering the Earth’s atmosphere. According to NASA reports, for use as fuel in an RTG, Pu-238 is processed with other materials into a ceramic form called plutonium dioxide. Since emissions from plutonium do not penetrate the skin, the primary hazard from Pu-238 dioxide occurs if it is somehow pulverized into very tiny particles that are inhaled, after which they can irradiate internal organs. Particularly at risk is the skeleton, the surface of which is likely to absorb the isotope, and the liver, where the isotope will collect and become concentrated. However, in the unlikely event of a launch or reentry accident that released the fuel, the ceramic form is expected to break primarily into large, non-inhalable pieces rather than fine particles that could be harmful to human health or the environment. This ceramic form also has a high melting temperature and a very low solubility in water, so these features greatly limit the movement of any material that might be released in the environment, further reducing the chance that anyone could be exposed to it, at least unwittingly. As explained earlier, nuclear power systems can be used both for the Earth-orbiting satellites and for more distant planetary missions. However, both of these missions start with a launch phase, where most of the failures might be expected to occur. 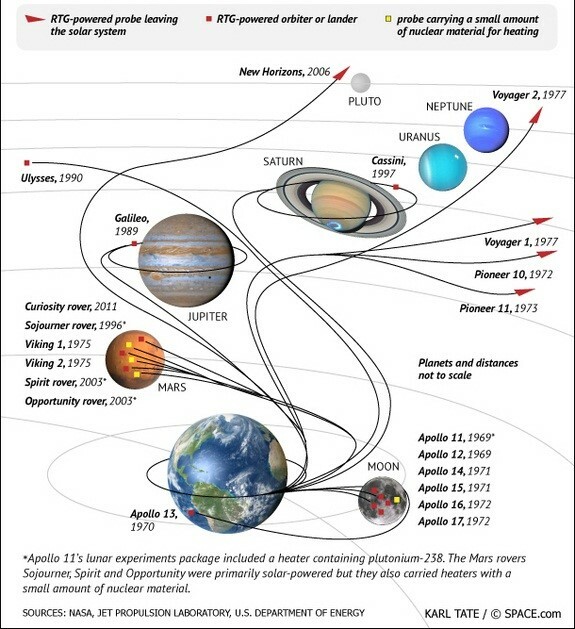 A good deal of effort has been invested to make today’s RTGs more or less impervious to the most likely launch accident scenarios, but NASA’s environmental impact statement still concludes that there is a 1-in-350 chance of a launch mishap in which plutonium could be released into the environment. Once the launch is successful, the rule of thumb for the satellites in low Earth orbit carrying nuclear reactor cores is to eject these cores into a higher disposal orbit at the end of the mission, where they stay a few hundred years and loose much of their nuclear power. But there were several failure incidents, some of which resulted in radioactive material reentering the Earth’s atmosphere, and even falling landside with possible human population exposure. 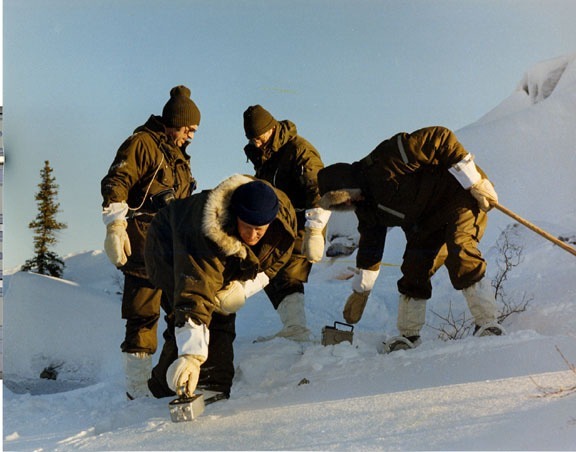 Department of Energy Nuclear Emergency Support Team members sweep for radiation following the crash of Cosmos 954 (Credits: Department of Energy). Taking a step back and looking into history can provide a better understanding of the problem. The first nuclear accident in space is reported as the USA’s Transit 5BN-3 satellite mission, which failed to achieve orbit in 1964, releasing its Pu-238 into the Earth’s atmosphere at an altitude of 50 km. In 1968, US’s Nimbus B-1 weather satellite exploded when the launch vehicle had to be intentionally destroyed shortly after the lift-off. The RTG was recovered from the bottom of the Santa Barbara Channel in the Pacific Ocean off California five months later, so no radioactive material had been released. In 1969, the first Lunokhod rovers of USSR were launched from Baikonur with another isotope, polonium-210, on board. However, the rocket exploded and radioactivity was spread over a large area of Russia. A failure of another USSR launch vehicle caused a nuclear piece to fall into the Pacific Ocean, north of Japan, in 1973. Five years later, USSR’s Cosmos 954 satellite accidentally reentered Earth’s atmosphere, scattering around 50 kg of radioactive uranium-235 over northern Canada. Although this area was sparsely populated, several residents were accidentally exposed to radiation -none resulting in serious harm- before a major recovery campaign succeeded in sweeping a total area of 124,000 square kilometers over the course of almost one year. (This accident is still the first and only instance where the 1972 UN Liability Convention was invoked between two signatories.) Another failure was Cosmos 1402 of USSR, in 1983. At the end of that satellite’s operational period, the reactor core did not separate to be sent into higher orbit as planned, but reentered the atmosphere with the remainder of the spacecraft, landing somewhere in the South Atlantic Ocean. One other important accident involving RTGs was the heroic Apollo 13 mission, which is known as the “successful failure” in space history. This mission fortunately ended up with return of the astronauts safely to Earth, however not only they but also their RTG, which was intended to be left behind on the Moon’s surface, made it back to Earth. The RTG and its 3.9 kilograms of plutonium dioxide plunged into the Tonga Trench in the Pacific Ocean, where it will remain radioactive for the next 2,000 years. Subsequent water testing has shown the RTG is not leaking radioactivity into the ocean. A more recent failure was Mars 96, a Russian Mars mission, which failed to escape the Earth and broke up over Chile after its reentry in 1996. Although it was stated that the spacecraft had splashed down into the ocean initially, further analysis showed that it is reasonable that the impact was in fact on land. The spacecraft, which was equipped with 200 grams of Pu-238, was never recovered since the exact location(s) of the impact could not be determined. The list above is definitely not complete, but it gives an idea of the results of possible accidental failures in nuclear-powered space missions. However, this is not the only danger. As mentioned before, the nuclear cores of RTGs are ejected to a higher orbit at the end of lifetime of a reentering satellite. This means that there are kilograms of nuclear waste spinning around the Earth at present. Although unlikely, any collision of these particles with other particles of space debris could possibly shift them to lower orbits resulting in their uncontrolled reentry. Therefore, while continuing to use the radioisotopes, as well as RTGs systems, it should always be kept in mind to consider all the possible failure modes, and take precautions accordingly for each of them. During 2013, the space exploration community received both some good news as well as bad from NASA. The good news is that, after long years of debates to find the budget to reinitiate Pu-238 production, the US has restarted this radioisotope’s production in its High Flux Isotope Reactor at Oak Ridge. However the production is still at a lab scale and for very small quantities. NASA estimates a necessity of 2 kg/year of Pu-238 for its robotic planetary missions alone, which might be satisfied once production reaches its estimated full scale rate in 2018 or 2019. However, any manned mission in the future will definitely need much greater amounts of the isotope. 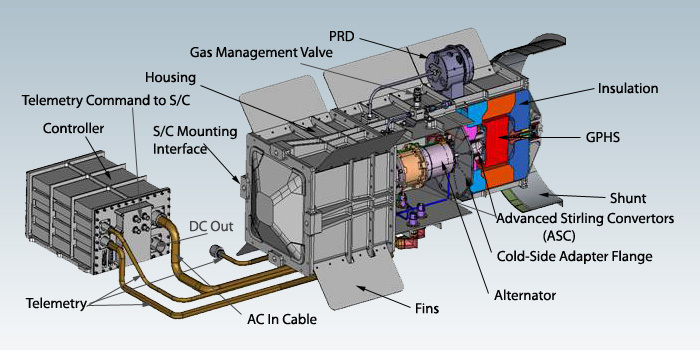 Diagram of NASA’s Advanced Stirling Radioisotope Generator, which has now been shelved (Credits: NASA/DoE). According to the current plans, the next mission to use RTGs will be a copy of the Mars Curiosity rover. This mission is estimated to be launched in 2020, and is expected to include around 4 kg of Pu-238. Another mission planned in the 2020s is a flagship probe to study Jupiter’s moon Europa. Considering these plans, it is promising to know that the US has taken action to start Pu-238 production, although it is doubtful that the production rates will satisfy the scheduled demand. Europe is also known to be conducting studies on alternative radioisotopes and estimating solid results by the end of this decade, which might act as a back-up stock. Every space mission contains some level of health and safety risks, as well as budget problems. Positioning ourselves in a completely risk-free zone would cease our exploration capabilities and constrain space science which aims to bring benefits to all humanity. So we should take up the challenge all together to successfully mitigate these risks, and all the space-faring nations should contribute to it both technically and financially. Since the environmental hazards of nuclear power mostly vanish once a spacecraft escapes from Earth’s gravity, a policy to limit the use of these systems only to space missions travelling beyond Earth orbit would minimize any undesirable results. Engineering studies for designing safer and more efficient nuclear power systems -not necessarily RTGs- should also continue in parallel, in order to raise our readiness level for possible crewed missions to the Moon and Mars. Since nuclear plants can be used not only as a source of electric power, but also a source of heat and propulsion, they might be our only choice to reach and support life and productive activities at bases beyond planet Earth. For the first X years after which it decays to Y Watts in so many years later??? Missed some Important detail there. And Watts is a proper noun,and thus, capitalized.